January 3, 2010 : Interview with Speedsolving.com member Rowe Hessler : Currently (at the time of this interview) holds the World Record for 2x2x2 Average (2.45 Seconds), and the North American Record for 3x3x3 Average (11.04 Seconds). He is the former World Record holder for 3x3x3 Blindfolded (52.27 Seconds - 2008). My favorite event would have to be 3x3x3. It is mainly all that I practice these days, besides a little one-handed. Just because it is my favorite does not mean it is my best event in competition, I just find 3x3 the most fun and exciting. I like the fact that there is almost always 3 rounds of it, so I have a greater shot at doing well. Ever since I broke the NAR at 9.13 seconds and becoming the first US citizen to get a sub 10 solve, I have been fixed on getting better. I now hold both 3x3 NARs and I hope to go even further up in the rankings as my cubing “career” progresses. Ever since I was little I’ve liked solving puzzles, but I didn’t get into twisty puzzles until my aunt bought me a cube on Christmas 2005, my freshman year of high school. At first I was just like “yay….cube..” with no immediate connection at all, but once my aunt showed me how to get one side, I had to learn how to solve the rest. I browsed the net and learned the Petrus Method, and got decently fast (sub20) with it within a year and a half. I competed in my first competition at Cornell Spring 2007, and switched to the Fridrich Method in the summer of that year. 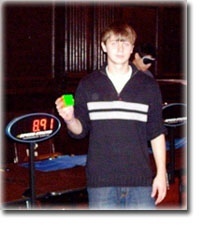 By far my biggest cubing accomplishment was my 2.45 2x2x2 average WR at Brown Cube Day 2009. I am very pleased with all of my official 2x2 results, and I now have the 5 fastest averages in official competition. Another great accomplishment of mine was my 52.27 BLD WR, back in 2008. I then knew that my blindfold cubing was over, and I then turned my complete attention to 3x3 and 2x2 speed. I really enjoy baseball. I was a relief pitcher for my high school baseball team and made varsity in my junior year. Sadly, I hurt my back last season and lost all my chances of playing college ball. I am also a black belt in Isshinryu Karate. That’s pretty much it for hobbies, unless sitting on the couch watching movies with my girlfriend, Katie, counts as one. I have many. First of all: hair in my cubes. No matter how hard I try, a hair gets in my cube at least once a day. I also get irritated when more advanced cubers are nasty to others on the forums. How will they learn any better if you just shoot them down? Help them, don’t hurt them. Most importantly: cheating. How will that help you in cubing at all? It will always come back to haunt you one way or another. There is no knowing what the future of cubing would be like. When I first started, I didn’t think 7.08 seconds for a single solve was possible, but Erik pulled it off. Many people are getting into cubing, and eventually they will be catching up to everyone else. Cubing has a very loooonggggg way to go. As far as my cubing, I’m pretty happy with my results so far. Maybe being consistently sub 10 average at home would be nice, but once I get sub 11 in competition I will be completely satisfied. I don’t see my 2x2 results getting any faster though. I’ve had so many enjoyable experiences in cubing, but I’d have to say WC2009 was the greatest ever. Meeting people from all over the world that I’ve only talked to on the computer was amazing. WC2007 was also a great competition, but that was back when I was slow. It felt nice to be a part of the friendly competition this time and seeing everyone again. Also, I was so happy to finally be crowned 2x2x2 world champion! I can’t wait for WC2011 so see all of my friends again.